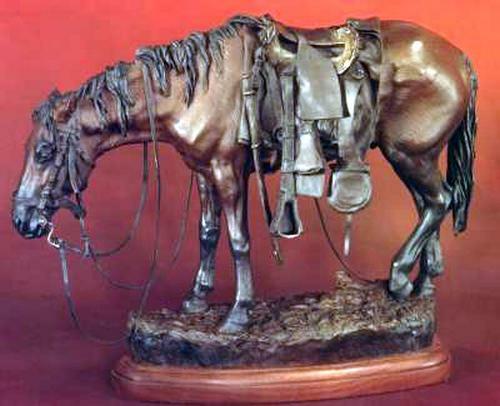 "The Empty Saddle" was created in honor of our fallen American Cavalrymen, not only of the War Between the States, but also the Indian Wars and, by association, all the wars and skirmishes in which the mounted cavalry took part. North, South, West...these men gave their all for what they believed in; all were proud to claim the title of Americans. Additionally, this piece is also a tribute to the noble horses who served just as valiantly as their riders and who, like them, at times made the supreme sacrifice. The war-torn horse equipments are basic U.S. issue for the 1860's period and, as such, by acquisition were also in standard usage by the Confederate Cavalry as well.